Saint Seiya: Ougon Densetsu Kanketsu Hen (聖闘士星矢 黄金伝説 完結編, Saint Seiya: Ougon Densetsu Kanketsu Hen? lit. Saint Seiya: Golden Legend - Final Chapter) is an RPG based around the anime and manga series known as Saint Seiya. It was developed and published by Bandai in 1988 for the Famicom. It is the sequel to the first Famicom Saint Seiya game, Saint Seiya: Ougon Densetsu. As with the original game, the story draws heavily from the first story arc of the series. This version picks up where the original left off, with the Bronze Saints about to take on all twelve of the Gold Saints in order to save Saori before time runs out. The game remains faithful to the original story, to the extent that your options are limited if you try to choose match ups that didn't occur in the show. The gameplay mixes side scrolling action scenes where a saint must survive long enough to reach a particular Gold Saint's temple, with a turn based combat system against the Gold Saints. In order to be successful at these turn based battles, the player must distribute a pool of Seven Senses to a Saints Life and Cosmos. When Life is lost, certain Saints can be revived under certain conditions, but many are taken out of play. Other Saints and characters become available at particular points along the story. 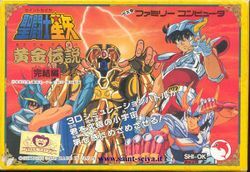 This game, and its sequel, were given a substantial graphics upgrade and rereleased on one cartridge for the WonderSwan Color under the title Saint Seiya: Ougon Densetsuhen Perfect Edition. Seiya becomes the partner and friend of other Bronze Saints: Shun, Shiryu, Ikki, and Hyoga. As the myth of the Saints, they must fight together to protect the reincarnation of the goddess Athena from any danger, as their predecessors have during millennia. The Bronze Saints are attacked by the Silver Saints sent by the Sanctuary's Pope to eliminate them. When they remain victorious, the Bronze Saints learn that Saori is Athena's reincarnation and that the Pope once tried to kill her as a baby. The Sagittarius Gold Saint Aiolos saved Saori but was killed shortly afterwards and gave Saori to her adopted grandfather. Deciding to join forces with Saori, the Bronze Saints go to the Sanctuary to defeat the Pope, but upon their arrival, Saori is severely wounded by an arrow from a Silver Saint. Believing the Pope may be able to heal her, the Saints go to find him, but are encountered by several Gold Saints in the way. Following several battles, Seiya gets to the Pope's temple and learns that he is the Gold Saint Gemini Saga who killed the real Pope to obtain more power. With help from his friends' Cosmos, Seiya is able to knock out Saga and use the shield from Athena's statue to heal Saori. Shortly afterwards, Saga commits suicide as a selfpunishment. This page was last edited on 4 April 2013, at 05:20.